Marc Webb's “The Amazing Spider-Man 2” is the best love story of the year to be inconvenienced by special effects. It's a movie where our two main characters are walking in the park, discussing their future plans. Gwen Stacey (Emma Stone) is telling her best friend/boyfriend Peter Parker (Andrew Garfield) that she will be applying for a scholarship to study in Europe. She tells him this as if she were telling a kid that his dog just died. Peter is trying to digest the news, not sure if he should be supportive, angry, or opposed. Then a giant blue electric guy attacks in Times Square that requires Peter to don his Spider-Man suit and move onto a scene that is easier for the audience to digest. There are many scenes similar to this where the characters have things to talk about that must be put on hold whenever a villain appears to cause trouble. Since there are three villains this time around (five if you count the soulless CEO's) that gives the movie plenty of opportunities to not invest in anything substantial. Even poor Spider-Man seems torn between three or four different major things at once. Aside from the usual multiple villains of the film, since this is the second installment (of this special edition of the series) it means that he gets to be both the hero and the villain. It's all very crowded, all very noisy, and all very perfunctory. 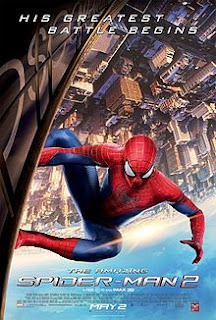 Ironically, this is similar to the style of Sam Raimi's “Spider-Man 2” (which is not part of this rebooted series) where Peter found it difficult to have a life of his own while carrying on the duties of being Spider-Man and protecting people. The Peter Parker in “The Amazing Spider-Man 2” is going through the same thing except he doesn't seem to care very much. Sure his life is interrupted on a daily basis, but this time around it seems like anything that ends up being really important is content to just take a break and wait for Spider-Man to no longer be needed. It's not that the battles with supervillains Electro (Jamie Foxx), Rhino (Paul Giamatti), or Green Goblin (Dane DeHaan) are boring, they just don't feel very important to what's going on. Does that mean the scenes that don't require Spider-Man are more substantial? A little, but not by much. Peter and Gwen may have graduated high school at the beginning of the movie but their problems they deal with feel like they would fit right in with a Disney Channel sitcom. Still, at least these scenes are interesting. Director Marc Webb tries to make something good come from these moments. Yet despite this being his second Spider-Man film, Webb feels very much out of his league when “The Amazing Spider-Man 2” needs to be a summer blockbuster. He seems much more interested in the human stories, but he has to film action scenes because…well, that's what people want right?. The studio even lets him do something to one of the characters that is much more daring than most movies of this type are allowed to do. The last fifteen minutes could be its own movie. “The Amazing Spider-Man 2” swings from being a good teenage drama to an average summer action movie. There are too many things happening for any of them to mean anything, and the movie doesn't seem sure of itself most of the time. The fact that one thing works is at least something I suppose, but how can I enjoy the part that does work if the action just continually interrupts? Parents, there is the usual amount of comic book violence. Recommended for ages 10 and up.